I’ve been browsing a website that’s new to me currently, called Love 4 Home and I’m really rather loving it. It’s a European site owned by a large Australian Furniture company, and they deliver free to the UK. With 5 different sections covering Rugs, Mirrors, Lighting, Cushions and Vases, they have some lovely home accessories spanning all kinds of styles. As ever, I’ve selected pieces that suit my more contemporary taste, but if you love Vintage, Shabby Chic, Classical or even Rustic, there’s something here for you. Firstly, this rug caught my eye as it’s made from a plastic and can be used outdoors as well as inside the home. 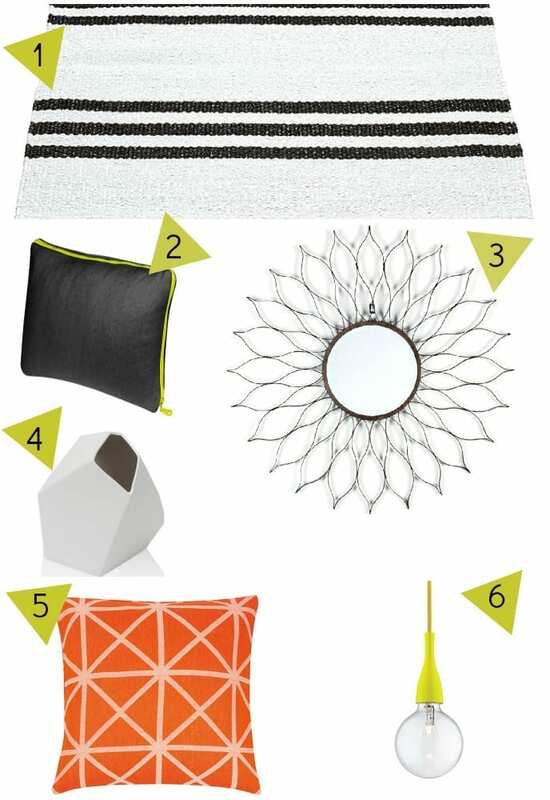 Obviously hard-wearing, patio rugs are gaining popularity and the simple monochrome scheme of this example will suit all kinds of looks. The cushion, with its pop of yellow piping would look stunning on the bed, and easy to mix with other colours and patterns. Mirrors have become much more a feature now, as well as a practical item, and this starburst Girasol mirror creates a real wow factor on the wall. At 140 Euros I think it’s a pretty good price too. Picking up the geometric trend, this sleek vase is perfect or a minimal or contemporary space and the coral cushion continues this theme into the soft furnishings. Finally, lighting is a big thing for me at the moment, as I’m hunting out some new lights for the attic conversion. I’m hoping to go for something minimal and was taken by these hanging yellow pendants. They would look great combined with a chrome or copper right-angled bracket hanging by the side of the bed. All of the details, including prices and where to buy are at the bottom of the post, but do check out Love4Home and don’t be put off by the European prices. Delivery and returns from the UK are all absolutely free. I love that yellow light pendant. I always see pretty individual things like this but worry that if I buy one nice thing it will just make the rest of my stuff look rubbish! I really like the vase and cushion! I’ve never heard of this site, so off for a browse now! Love the idea of the rug, be great to have one on our decking in summer. Lightbulb is v cool too! That orange / apricot cushion is speaking to me!